Not one speech was made at the championships that failed to mention the referees and rightly so. The winner Steve Mifsud, the runner up Charlie Chafe, the ABSC President Frank Dewens and the TD and VBSA President Paul Cosgriff all had something positive to say. The referees in question were, in no particular order, Abraham Newman, Praveen Chandra, Neil Brown, Mark Bini, Anuj Rathee, Colin Winter, Kim Ivett, Jim Lewis, Jon Moss and Brendon Lang. It was originally the intention of Tommy Watson of Tasmania to join the ranks but personal issues finally prevented that. Brendon Lang was also an entrant in the event itself but made himself available as soon as his match finished on Friday despite a heavy cold, he was fortunately able to be available on Saturday after recovering somewhat overnight. Colin Winter and Mark Bini also managed to beat the pain barrier to participate as did Kim Ivett, all with various leg and other aches and pains and a big thanks go to all of them. Neil Brown was once again tireless and completed 8 matches over the weekend, not all of them as easy as the 5 - 0 semi-final that he took charge of on table 5 between eventual winner Steve Mifsud and his victim on this occasion, Matthew Bolton. The easiest match by far however was the one the gods reserved for myself, ably assisted by George Hoy on the scoreboard. This match was held in the pit between Adrian Ridley and Tyson Crinis, it took 55 minutes to complete the four frames which also included a toilet break and contained 5 breaks over 40. As awesome a display of potting by any player we have ever seen and agreed by both George and myself that it would have been hard even for the players on the professional circuit to have lived with Adrian. 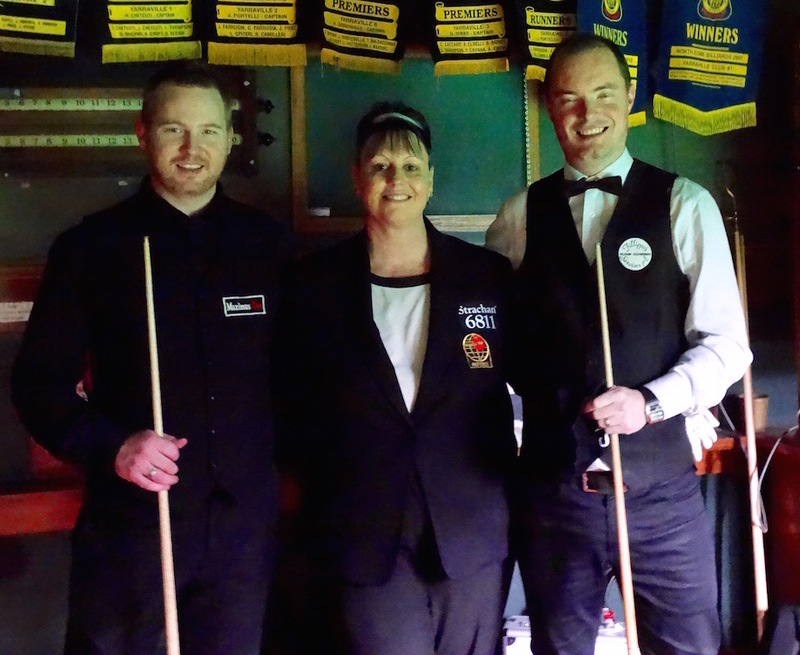 That match was a quarter-final and the semi-final that it got Adrian into was at the other end of the room on table 1 and overseen by our newest Class 1 Snooker referee Kim Ivett. This proved to be another very easy match to referee once the lighting in the room was made satisfactory. Adrian started this match as he had finished his last with breaks of 59 and 61 with a foul by Charlie to let him in which saw the frame score showing a lopsided 124 - 0. This did not faze Charlie in the slightest and he took the next four frames with his own display of attacking snooker to almost make the match a formality. Adrian, not one to give up at any time, did take the 6th frame but Charlie ran out the winner in the 7th frame with another 57 break after making the same score in frame 5. The quality of the play earlier witnessed in the pit did not desert the final that was so ably officiated by Jim Lewis. Steve Mifsud took the 1st frame, Charlie the 2nd and Steve the 3rd and 4th. Charlie then took another four in a row to leave Steve trailing 3 - 5. 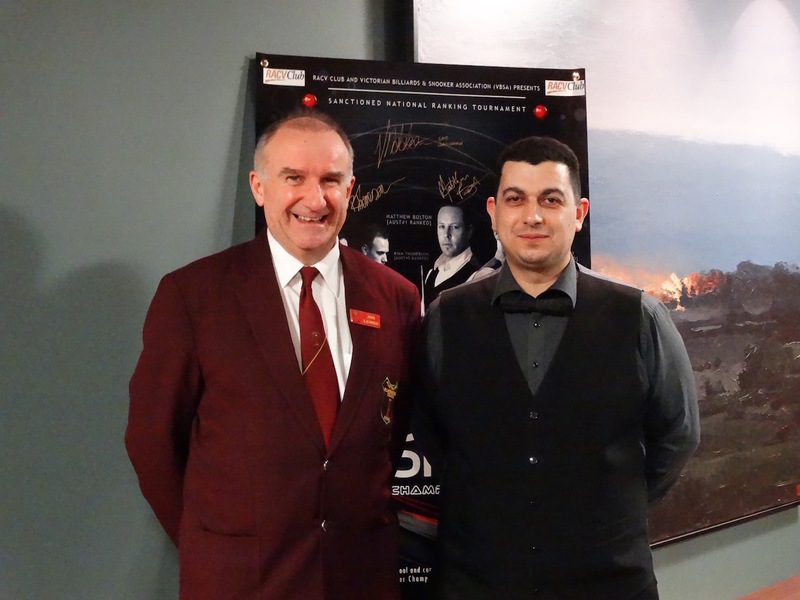 Steve Mifsud has not been the Australian Champion 7 times previously without being a very dangerous opponent in that type of situation and so it proved once again as he took the last 3 frames, including two sizeable breaks, to equal the record of wins for this event with his eighth. The performance by Jim Lewis in this final was almost flawless apart from one brain fade on the scores at one stage of the match which did not have any bearing on the players or the result. His many years of experience was otherwise on display and he was deservedly thanked for his performance by both players and officials. 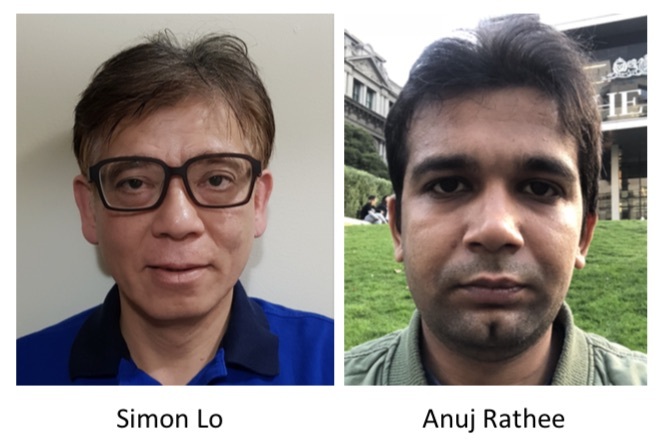 We welcome Simon Lo and Anuj Rathee to the refereeing fraternity after their success in gaining Class 3 Snooker accreditation. Both candidates proved to be intelligent and enthusiastic in completing the course and successfull in their examination. They have both committed to being fully inclusive in as many tournaments as they can and will be new yet very welcome faces at Yarraville early next month for the Reventon Classic. During Kim Ivett's recent offficiating at the Welsh and Gibraltar Open events, it was brought to the attention of all referees present that several countries were misinterpreting this rule. That also included Australia. She has been requested to relay the following. In particular, the penalising of players who touch balls during consultation. Relevant parts below. It is currently common practice during our matches, that when a Miss is called by the referee, either player touching any ball is penalised seven points regardless of, or prior to, being consulted regarding the correct positioning of the balls being replaced. Example, the cue ball or object balls being retrieved from a pocket or new position by a player, after a request to have the balls replaced has been made. It is now an instruction to all referees that, unless the referee has initiated consultation with players or requested such interaction, the penalty is not applicable! It seems, contrary to our previous belief, that the key words are "during consultation" together with "in play" and are the drivers for interpreting the rule in the revised manner that is now declared. The balls would be considered 'in play' after being replaced by the referee. It is also believed that formal changes to these rules are being considered for introduction soon and may offer easier application. This directive applies across the board and is to be implemented in all competitive and/or refereed frames of Snooker. Six referees, John Ivett, Kim Ivett, Praveen Chandra, Neil Brown, Jon Moss and Jon Loughron were the officials that covered all round robin and knock out stages of the Reventon Finals with Brendon Lang and George Hoy stepping in to make sure all 8 tables were covered for the OneforSeven events. A very smooth and satisfying tournament was the result as is only to be expected with that much experience in the room. John, Kim, Jon Loughron and Praveen are seasoned OneforSeven referees and knew how much fun was to be had during this stage of the weekend, a fact which quickly became apparent to the first timers. Kim and Neil were the semi-final referees with the vast experience of John overeeing the final. Kim took charge of the Ryan Thomerson /Aaron Mahoney semi which Ryan won by 5 frames to 2 with breaks over 40 in all but two of the seven frames, 2 by Aaron and 3 by Ryan. Neil had the Steve MIfsud/Matthew Bolton semi-final which went down to the colours in the deciding frame. Matthew won the 2nd, 3rd, 6th and 7th with a break of 75 in the 7th. Steve then had to come from behind after winning the 1st with a 61 break, then by winning the 4th, 5th, 8th and 9th. The OneforSeven events were next, first thing on Sunday morning with Johl Younger prevailing in the men's competition and Caroline Ruscitti taking the accolades in the women's event. Up then stepped the inimitable John Ivett to enforce the rules in the Grand Final between Ryan and Steve. With only one break over 40, a 60 by Ryan in the 3rd, it was still a masterclass of snooker by both players with the vast knowledge and experience of Steve only matched and finally overcome by Ryan with his excellent long game and break building technique, which was still in evidence despite the lack of any breaks over 40 except the one mentioned. Matthew Bolton with the highest break of 114, Johl Younger posting a 104 and Shaun Dalitz, 101 were the three players to claim the prize on offer for each century break. No better snooker tournament has been witnessed in Melbourne for a very long time. Praveen Chandra had a wish which was to take charge of the Grand Final of the Australian National Championships. The 2017 tournament was where that ambition was realised. 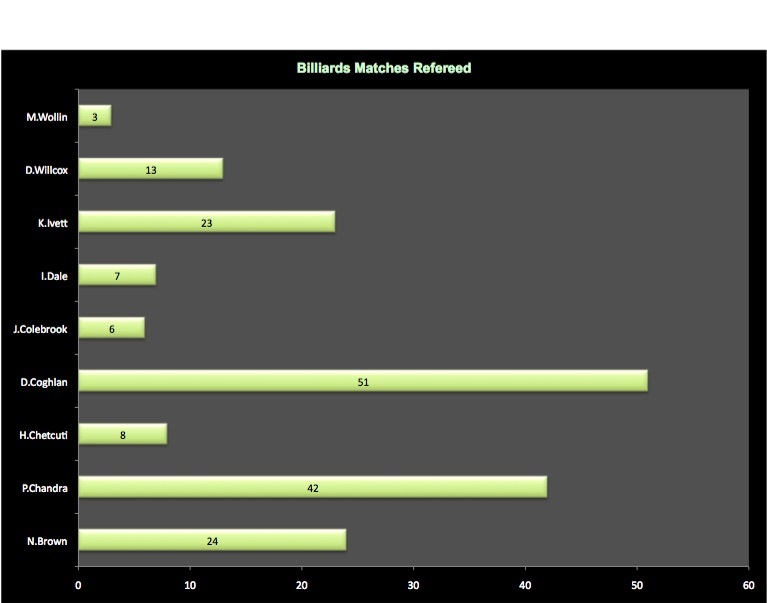 The match between winner, Adrian Ridley and runner up, Steve Mifsud despite being played over 11 frames, 9 of which were completed, did not come anywhere near being the most difficult of the weekend. I must say that Praveen did a good job even though nothing contentious came up during the proceedings. This was not the case for all referees in attendance however. Jim Lewis had a 6 hour match first up, Colin Winter and Mark Bini were both thrown to the wolves with back to back 7 framer's. Colin's legacy was a popped knee which kept him at home the next day unable to walk very far. Mark also suffered as his broken foot was not yet fully healed and he was only able to complete one match on Saturday before succumbing to the pain. Despite these setbacks the referees performed well enough that nobody noticed them, which is as it should be. Long stints at the tables was the lot for most of them on Friday and Saturday but the result was as smooth a running of a tournament as one could wish for. Congratulations for a job well done to Praveen, semi final referees Jim Lewis and Abraham Newman along with John and Kim Ivett, Neil Allison, Neil Brown, Mark Bini, Denis Coghlan, Michael Lang, Adam Beitner and Colin Winter from Victoria, with special thanks to Glenn Domeika, who travelled from S.A.
First time and after a long time. Jon Loughron was the tournament director and roving referee for the ladies Victorian titles held at Cheltenham and then match referee for one semi final and then his first ranking final with those matches being played alongside the mens finals at Brunswick on Sunday. He proved to have the competence and the stamina to withstand a very long and tiring day as both of his matches went to the deciding frame. Neil Brown returned to the No. 1 table arena to take charge of the mens final after a long time between drinks and continues to prove what an asset he is to Victorian and indeed, National Billiards and Snooker. The best of nine final was over after only 7 of those frames and in Neil's own words, probably one of the easiest he has done. Well done to both Neil and Jon. Jon Moss has now completed all his matches in Beijing and is headed home. Lots of positives from the trip and experiences to treasure. He has represented Australia, Victoria and Maccabi with distinction after following in the footsteps of Kim and John Ivett who have both also represented Australia and Victoria in overseas events in recent years. All three have enhanced the growing reputation in far flung corners of the globe of the competence of our referees. The IBSF World U18 & U21 Snooker Championships will this year be held in China between the dates of 7th and 17th of July. Expressions of interest were called for from Australian referees to officiate at this prestigious event which prompted a response from Jon Moss. I am delighted to announce that this application has been met with an affirmative answer. Jon will be travelling to China with the blessing and encouragement of the V.B.S.A. 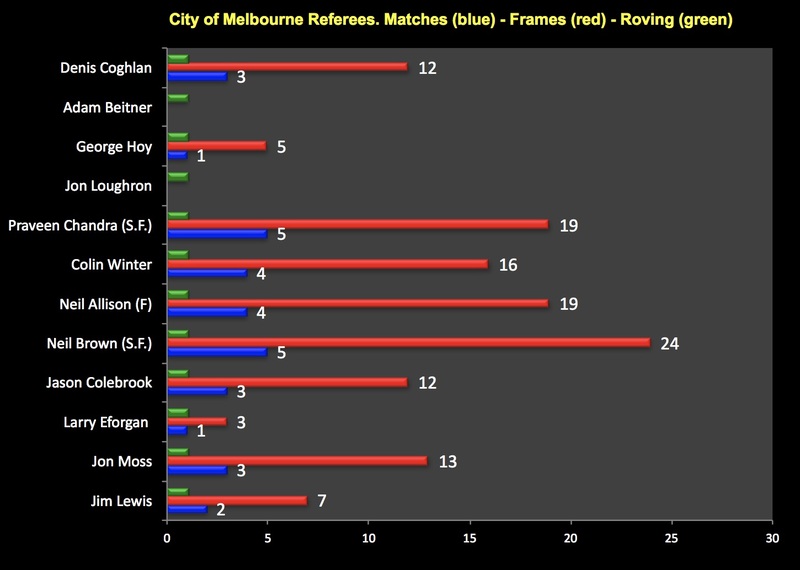 as well as the other Victorian referees. Jon has had a meteoric rise as a referee since first being accredited and has elicited admiring comments from many of his senior comrades. His profile along with those of other Victorian referees can be found on the referee profile page on this site. Venue directors for the 2017 City of Melbourne tournament were George Hoy at the Reventon Academy, the new HQ in Yarraville, Jim Lewis at the R.A.C.V., Praveen Chandra at the Brunswick Club, Jon Moss at AK 8, Colin Winter at North Brighton, Adam Beitner at Cheltenham and Larry Eforgan at Bentleigh. Referees assisting with roving duties were Jason Colebrook, Denis Coghlan and Neil Brown. A big thanks to Adam, Colin, Jason and Neil Brown for stepping in at the last moment when circumstances made it seem that not enough referees would be available on the day. Saturday morning brought all sorts of problems, with referees calling in sick or having to leave early because of previous engagements. These were alleviated in a very large part by the addition of Jason to the Snooker ranks and what an excellent job he did. The other things that took the pressure off were the speed of the early matches and the decision not to use one of the tables after round 2. Semi-final referees were Neil Brown who took charge of the match between Johl Younger and Shaun Dalitz, a match won by Johl but graced with two marvellous breaks by Shaun, one of 86 and another of 94. Praveen was the referee for the other semi-final between Steve Mifsud and up and comer Cale Barrett with Steve on fire in the last 3 frames after a very close first and the second taken by Cale in some style. Neil Allison then had a very enjoyable time refereeing a grand final between Steve and Johl with no contentious decisions to make and two absolute gentlemen to take charge of. He, nonetheless performed as a grand final referee should with a very competent performance. George Hoy was again Tournament Director and helped in a big way to make this tournament one to be proud of. 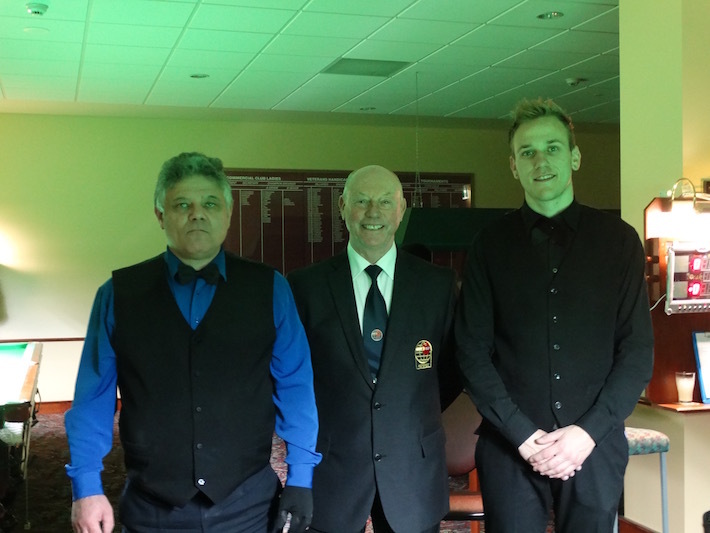 Jon Moss and Neil Brown were the referees involved in the under 21 Billiards and Snooker Championships which were contested at the Brunswick Club on 6th, 7th, & 8th April. A very small field of junior players from around the country meant that all the matches could be covered by just these two referees and myself and is a major disappointment for this tournament and the future of the sport in general. The standard of refereeing was not compromised however with Neil as ever, doing a very competent job in the Billiards final held on Friday night. The performance of Jon in particular must be noted as he took charge of one semi-final and then the Snooker final itself without a stumble and whilst nerves must have come into play, none were shown and he deservedly received the thanks of the players and the tournament director. The board of the VBSA wish to advise all pennant players that Rule No. 8 of the current ByLaws (Matches) has been revised to clarify that if any player were to be in arrears by 10 points plus the value of the colours remaining after potting the final red, then the player would be allowed to finish that turn at the table and that the frame may only be claimed or awarded if the 10-point rule can be invoked at the conclusion of the turn. It is also to be understood that any player with the advantage of that rule and is ahead in the frame by enough points has the right to claim the frame at any time during any turn at the table as soon as the rule comes into effect. Please refer to below LINK to view updated ByLaws. Thanks to Shelly Ames for highlighting this issue. Kim Ivett continues to be the face of Australian refereeing on the world stage as Neil Robertson and Matthew Bolton are to Snooker and Billiards respectively. Her recent sojourn to the holiday town of Mol in Belgium for the World Under 21 Championships saw her take charge of the Women’s final between Nutcharat Wongharuthai and 3 – 1 winner Siripaporn Nuanthakhamjan, both from Thailand. Fabulous names but surely a little challenging for an English speaking referee when calling the scores! Her travels now take her to Fürth, near Nuremburg in Germany where she will officiate at the Paul Hunter Classic. The culmination of the season at the R.A.C.V. last weekend with the Australian National Championships saw maybe the best of all the tournaments this year. The high standard of refereeing along with the adequate numbers, especially on Saturday when there were perhaps even too many, did not make the absence of some of our luminaries too much of a problem. With Kim on her way to Belgium for the World U/21s where she has met up with the Australian boys Adam Bleumink, Alex Pace, Ben Foster and Cale Barrett, and John Ivett and Abraham Newman also with prior commitments, it was left to many of the new boys to fill in and with the very encouraging words from the A.B.S.C. President about the refereeing side of the tournament, I would also like to add my appreciation of all the work done by those involved. Jim Lewis who had a sensational, if a little one sided, final to oversee, the two semi-final refs, Mark Bini and Neil Allison, Praveen Chandra, Neil Brown, Denis Coghlan, Jon Loughron, Jon Moss, Colin Winter, Brendon Lang, Michael Lang and Gordon Males. In stark contrast to the issues of last year the Victorian refereeing standards continue to lead the way. Well done to all. The Victorian referee convoy on the highway to Albury this year included John and Kim Ivett travelling up with Polly to keep us all under control, Neil Allison after a long absence from the Fred Osbourne, Jon Moss for his first time with myself as his passenger and in transit listener. A much easier work load than in previous years due to the low entry numbers and the assistance of local referees Leigh Condon, Don Walker and Graham Tucker made the weekend that much more relaxing and enjoyable as we availed ourselves of the very warm welcome and fantastic facilities of the Commercial Club. The snooker tournament itself was run without a hitch and with little or no controversy, many favourites falling by the wayside and a final contested by one of the old guard in Joe Minici against new blood in the guise of Ryan Thomerson. This final, as have many others in the past, was overseen by the highly experienced John Ivett conducting things in his own inimitable style. Ryan was the eventual winner taking the final 4 frames to 2 over a rather subdued Joe Minici. Abraham Newman at last got the opportunity to shine at an Australian ranking event and his handling of the 2016 Lance Pannell final between winner Shawn Budd and James Mifsud was all that could be expected of this highly competent and experienced referee. Shawn was moved to say some very nice words to Abe after the match and although it was as an easy one as far as matches go this can take nothing away from his performance. It also proved to be the climax of a very good event for all the officials on hand to ensure the smooth running of proceedings. Lots of experience headed by Kim Ivett and Neil Allison was also backed up by strong performances by Neil Brown, Colin Winter and Denis Coghlan and the ever willing Abraham. An easy tournament for me due to the expert work of the troops and a good tryout for the new scoring system which will need a little bit of tweaking but on the whole successful. The Victorian State Titles was this year contested using two venues. The referees in attendance at Yarraville were John and Kim Ivett, Neil Allison, Jon Loughron, Neil Brown and Denis Coghlan. The attendees at Brunswick were unusual because of the fact that all these referees came from the Maccabi Club and to my knowledge the first time that one club has supplied all the referees for one venue. It did not come about through design but because of the venue preference of all referees being taken into account and just the way it turned out. Those referees were Abraham Newman, Brendon and Michael Lang, Colin Winter, Jon Moss and myself. With the rescheduling of the quarter finals from Saturday to Sunday morning there was an added necessity for extra troops and the call was answered by Denis Coghlan and Abraham Newman. Neil Brown who was in attendance as a semi final referee did the 3rd quarter final whilst I took charge of the last one. John Ivett and Neil then oversaw the two semi finals with Kim Ivett once again and very ably, taking on the final. Neil Allison was the referee for the very good final between winner Aaron Mahoney and runner up James Mifsud and performed with the competence we have come to expect of him despite it being one of the easiest finals of recent years to referee. A very good turn out of referees who all proved to be up to the task, made this tournament a labour of some satisfaction. Special mention goes to Colin Winter appearing in his first event since accreditation and who did not let himself or the organisers down. 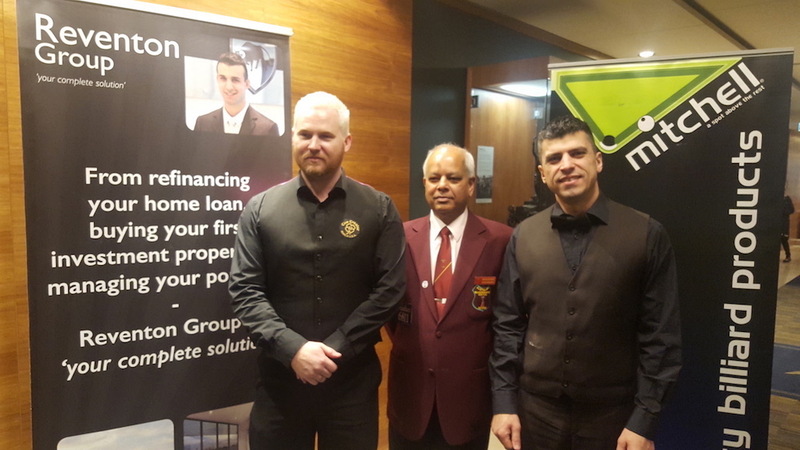 The weekend’s proceedings started at the venues of the Bentleigh Club overseen by Praveen Chandra, Yarraville was in the safe hands of John and Kim Ivett, George Hoy was at AK 8 and home venues were directed by Jon Loughron at Cheltenham and Neil Allison at North Brighton. Jim Lewis and Mark Bini who appear for one of the R.A.V.C. teams in the Melbourne pennant competitions were also at their home club with Neil Brown taking over from Mark in the evening, whilst the final venue of Brunswick had to put up with myself assisted by the very able Colin. Reports from the venue directors indicate very few problems and very little out of the ordinary, which is music to the ears for all concerned. Unable to dodge other commitments, Jon Loughron was replaced by Denis Coghlan and Abraham Newman for the knock out stages on Saturday which went without a hitch except for the knock on effect of the very long match between Darryl Tippett and Westerner Paul Veitch. No fault can be laid at Kim’s door for the length of this safety conscious game but it did mean that the quarter final match between Ayaz Khan and Peter McCullagh in the same half of the draw, itself a very long drawn out affair because of lots of safety play and some tiredness of the players, did not finish until nearly 11 p.m. and had referee Mark Bini in desperate need of some R & R.
The almost uneventful semi finals between James Mifsud and Daniell Haenga in the hands of Abraham Newman and Aaron Mahoney vs. Peter McCullough with Jim Lewis in charge, while both going the full distance and finishing within 15 minutes of each other, proved to be fast, entertaining and of a very high standard and gave neither of these two very experienced referees any trouble. Our world travelling referee Kim Ivett is now on her way home from the U.K. after playing a prominent part in the Welsh Open Snooker Championships. In the course of her participation as an official there she has taken charge of matches that have included the players Tom Ford, Jason Weston, Luca Brecel, Ian Burns, Ben Woollaston, Jamie Cope, Dechawat Poomjaeng, Robert Milkins, Ali Carter, Fergal O’Brien, Robin Hull, Mark Allen, Ken Doherty, Joe Perry, Graeme Dott and Marco Fu. She has also marked for the referees in charge of the matches between Neil Robertson V. Marco Fu and Ronnie O’Sullivan V. Yu De Lu. Some awesome names there I think you would agree, including four world champions. Safe trip home Kim where a warm and congratulatory welcome awaits. The attachments here are the general statistics, mostly in chart form, for the refereeing activity in 2015. No stigma or kudos should be attached to the amount of commitment from each referee, as work, study, health and lifestyle will always dictate how much each person is able to contribute. Even officiating in one match adds to the riches that Victoria possesses in its professional guardians of the rules. A debt of gratitude, duly paid here, is owed by the board and members of the V.B.S.A. as well as the players Australia wide, for the commitment and professionalism displayed by all the Victorian Referees. Wishing all a restful break and a pleasant festive season. Adam Beitner, Jon Moss and Colin Winter have joined our ranks with their successful negotiation of the examination for Class 3 Snooker referees. All three are long time pennant players and members of the Victoria Maccabi Snooker Club and have had a good working knowledge of the rules for some years. Their accreditation as qualified referees comes after some intense sessions with the rule book and assessments of their time at the table. I am sure that all three will in time, enhance the established and enviable reputation of the Victorian referees. The final tournament of the year Pot Black, this year held at the Brunswick club resulted ultimately in a shootout between the recent Australian Open champion Charlie Chafe and The City of Melbourne champion from earlier in the year, Ben Judge. Charlie was in excellent form carrying on from his triumph in the Bob Hawke and he started with a comfortable victory over Paul James which included the highest break of the tournament, exactly 100. The later rounds saw him pitched against Henry Lau with his very good safety game but he managed to overcome that quite easily in his 3 – 1 victory. Next came the quarter finals and a fairly quick 3 – 0 win over Ryan Thomerson who had had the wind knocked out of his sails by one of the stand out players of this weekend, Steve Ebejer. Ryan had advanced from that match only after a very hard fought 3 – 2 win. Charlie’s semi final opponent was James Mifsud who can never be discounted no matter what the company but it proved to be Charlie’s day once again with another quick victory 3 -1. Ben had a very different journey to the final in first overcoming Ray Farley 3 – 1 then Daniel Faddoul 3 – 0. His quarter final match up was with Kurt Dunham who did not produce the exciting snooker we are accustomed to seeing from him in the face of Ben’s steady but accurate game, with Ben prevailing 3 frames to 1. So then to probably the best of his matches from a spectator point of view against a very much improved Shaun Dalitz. We all know Shaun to be a very good player but new heights to his game have now been found and I’m sure many good things await in the future. Ben proved to be best on the day and he got over the line 3 – 2. And so to the final which in the end was pretty one sided with Ben at the races and winning the cup and Charlie not bringing his A game to a very poorly attended final. The speeches included thanks to all who did turn up to watch with plenty of available seats and positions unused. George Hoy was again the master with the reins in his hands and a smooth running of the tournament was again his legacy, notwithstanding having only six tables with which to get through all the matches in the two days available. The referees were also a huge part of the success of the proceedings and thanks go to Brendon Lang, Michael Lang, semi final referees Neil Brown and Abraham Newman and a very competent and unobtrusive performance from the Grand Final referee Praveen Chandra. On the 9th of September 2015 at the Mulgrave Country Club an examination was conducted by John Ivett and myself which the candidate, Neil Allison was successfull in passing and is duly upgraded to Class 2 Snooker. Neil's profile on that page has aslo been updated. Adrian Ridley, determined not to lose three finals in a row successfully overcame any demons he may have had to secure an important win before taking off for Bendigo along with Ben Judge, to contest the Goldfields Open against the cream of the worlds players, including current world champion Stuart Bingham and our own Neil Robertson. Speaking of Neil, another with that name took charge of this final between Adrian and runner up, Kurt Dunham. With Mark Bini on the scoreboard and Neil Allison in charge of proceedings not a hitch was to be found and the Grand Final was as well controlled as all the other matches have been over a very tiring but satisfying weekend. John Ivett and Kim Ivett were on hand Friday evening and Saturday morning only as Kim adds a further notch to her belt with refereeing duties to perform in Bendigo and taking off for the goldfields in the afternoon, we wish her well. Praveen Chandra, Neil Brown, and myself were the others who took care of business on Friday evening with Mark Bini and Abraham Newman providing reinforcements on Saturday. A very professional performance from Neil Allison enhanced a competitive and enjoyable final that can be watched again on YouTube courtesy of Cueball T.V. Mark Dunn, John van Zanden and Mike Poda were once again masters of the Masters in Frankston on Sunday. 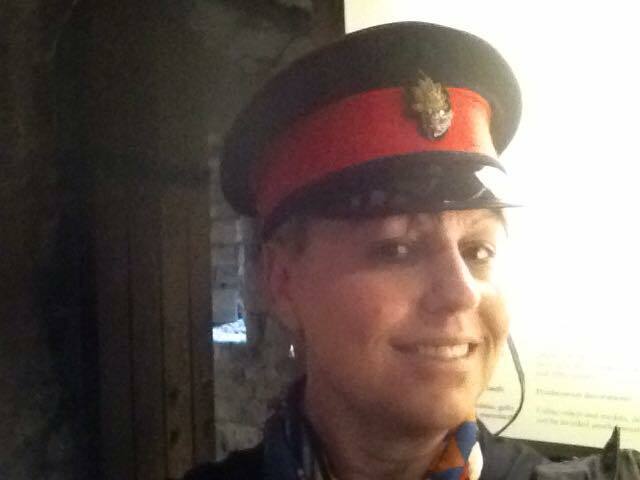 A really fun day for all and especially for us refereeing. It was a chance to enjoy the excellent snooker without too much pressure on us to concentrate as much as normal with the relaxing of so many rules for the Oneforseven format. Jon Loughron at his first attempt at this type of competition performed admirably as did the rest of the team, John Ivett, Kim Ivett and myself from the inaugural Frankston Masters, with only Jim Lewis missing from that first one. A very good crowd saw some really top notch snooker with commendable breaks from Aaron Mahoney (71), Ryan Thomerson (75), Rudy Sulaeman (68) and the highest break of the day which I had the good fortune to oversee, from eventual tournament winner Adrian Ridley with a very well constructed and fast 104. An opportunity was also taken to present Paul Thomerson with his refereeing accreditation certificate and he took no little stick from his fellow players for crossing to the dark side. On 16th of July at the opening ceremony for the Australian Open Billiards Championships Henry Chetcuti was presented with his certificate which shows his status to now be Billiards Class 1. An overdue and well deserved upgrade due to his work both with Mike D’Silva in previous years and with myself and John Ivett this year in promoting many new Billiards referees. The latest members of that fraternity were also deservedly honoured with their newly acquired Class 3 certificates at the same time. Welcome Jason Colebrook, Ian Gilbee, Warwick Loton, Jacob Streiff, Mick Williams and Mike Wollin. 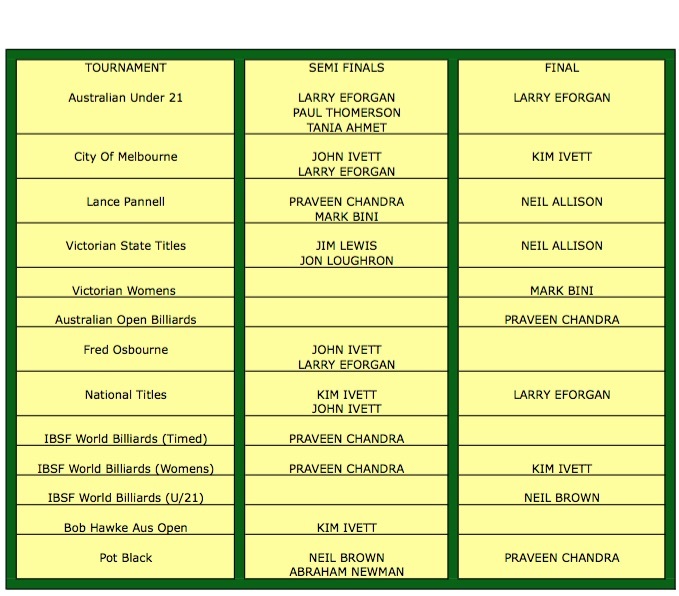 The City of Melbourne tournament for 2015 has now been completed and can count among the successes for the V.B.S.A. referees. A truly city wide tournament with round robin matches being played by every entrant regardless of their ranking and held at seven venues across the city. The Brunswick Club had three groups which were overseen by Damian Willcox and Brendon Lang. The Yarraville club also had three groups which were kept in line by the formidable father and daughter team of John and Kim Ivett. Jon Loughron was the director and referee for his own club of Cheltenham which had two groups, as did the Bentleigh Club ably overseen by Martin Deeley. Neil Allison also took charge of his home club of North Brighton, holding proceedings for one further group. AK8 was also a venue for one group which was under the watchful eye of George Hoy who was also the Director for the whole tournament. The final four groups engaged in hostilities at the R.A.C.V., the home base of this tournament and where all the knock out stages were also held. Mark Bini and myself were the men in charge of the boys there on Saturday and a fun day was had by Mark and myself which I hope was also true for all the other venues. The knock out stages of the tournament were held on Sunday and Monday of the holiday weekend with the semi finals and the final being held on the last day naturally. The referees in attendance on Sunday were John Ivett, Kim Ivett, Praveen Chandra, Jim Lewis, Neil Allison, Mark Bini, Abraham Newman, Brendon Lang and Neil Brown. The magnificent venue that is the Billiards room at the R.A.C.V. was further enhanced by the sight of the red jacketed referees at every table. The performance of those referees in no way detracted from their appearance and positive and supportive comments were heard from administrators, players and spectators alike. On Sunday John Ivett made no complaint or objection to being in charge of the match that was expected to be the slower of the two semi finals, while I selfishly took the faster one. Guess which match finished first! Kim Ivett then took charge of the final between Ben Judge and Adrian Ridley neither of whom were strangers to this stage of an event. It has to be said that proceedings did not live up to their high standards and a scrappy affair was won by Ben Judge in the ninth and deciding frame. This in no way detracts from the performance by Kim who handled a very tiring final as well as any other she has done. 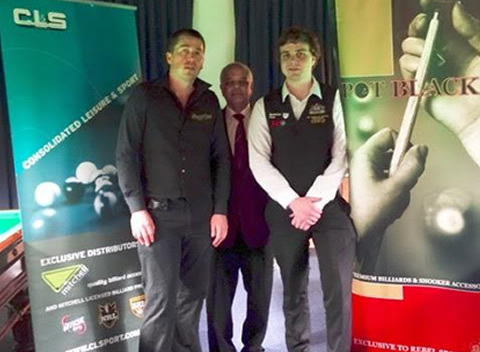 Praveen Chandra has also submitted a report on the match he officiated in between Aaron Mahoney and James Mifsud, with particular emphasis on the 137 break by Aaron. This will hopefully also be reproduced in the next issue of Spot On. 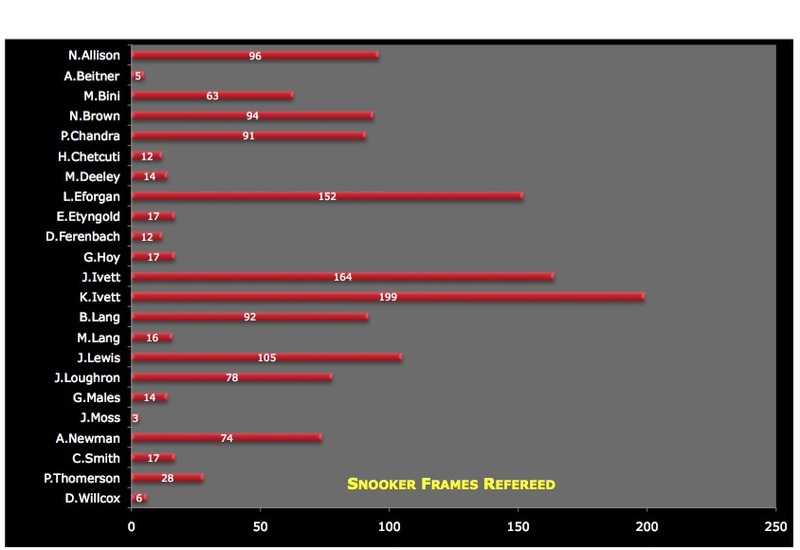 Over the years I have refereed quite a number of “clearance” frames of snooker. On 07 June 2015, I witnessed first-hand, one of the most skilfully constructed frames of snooker by Aaron Mahoney. It was a pity that there were only a couple of people present to see the spectacular display of carefully controlled stroke making. In my recent refereeing history, amongst a few others, the memorable highest breaks were by Neil Robertson – 142, Ryan Thomerson – 125 and the latest Aaron Mahoney – 137. Earlier, in the last sixteen match, Aaron went into full flight and made a 116 break. In the quarter final match against James Mifsud, Aaron was 2 frames down. James had played exceptionally well in the first two frames. In the third frame and on the second visit to the table, James played a poor safety shot. This let Aaron pot the first red then black . Seven red/blacks later  he faced a difficult pot on the next red and had to play the blue , followed by 2 pinks , 3 blues  and the final red/black all up = 110; followed by all the colours = 137 clearance. In the process, he had to break open the pack. Deft cuts, deep screw backs, a few - gentlest of red ball pots and one five cushion on the red got him back in on the black position. The last red was a straight pot but it required Aaron’s full concentration. Quite a number of times he got down to play, lost his breath, regained and lost before he finally played the red which rattled against the pocket before falling into the pocket. He then had to play a difficult cut on the black to get on the yellow. After this it was plain sailing. It took Aaron twenty five minutes to perform the deed. I timed the match as follows. The first two frames were over in less than twenty minutes; three in forty five and the next three in just under one hour. I thoroughly enjoyed this match because of the quality, precision stroke making and attacking play by both players. George Hoy asked me what I was doing standing at the management table… He didn’t realise that I had already packed up and was ready to head home!!!! Paul Thomerson and Daryl Ferenbach have now both completed the course for referees and have also passed the examination. They are both very welcome additions to our ranks and Daryl in particular is keen to be active and will soon, I'm sure, be a well known face. Paul is someone who is familiar to all in the sport and although he is expected to be playing at the pointy end of most tournaments his accreditation will be valuable to him and us in his position as National Coaching Director. Paul has been added to the list of referee profiles with Daryl to follow soon. May 14th to 25th are the dates that Q-School will be run in the U.K. this year. Two events will be held, ensuring a double chance for all the worlds prospective players to earn a place on the World Snooker Tour. There will be eight cards up for grabs which will guarantee entry to the tour for that player for the next two years. Both sets of four semi finalists will earn those cards. The entries for this year number a record 166 players from no less than 22 different countries. Matches will be played under World Snooker tournament conditions over 7 frames. 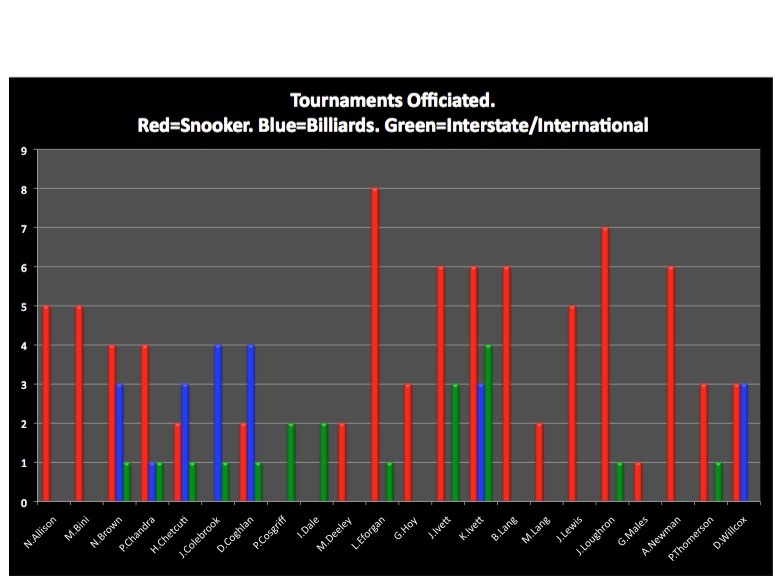 Qualified referees will officiate in all those matches and will be assessed by official World Snooker assessors as the tournament progresses. Kim Ivett has accepted an invitation to be one of those referees and we wish her Bon Voyage and high achievement and send her off with confidence that she will open the eyes of the world to the talent hiding in Victoria, Australia. 2015 Oceania Championships (NZ). Kim's Report. The 2015 Oceania Championships were held in Auckland New Zealand at Snooker World, Royal Oak from the 17th to 29th of March. The venue had eight tables upstairs which were arranged with fairly confined spacing and two tables located on ground floor. All tables were used for the Tournament play. The Championships included Billiards, 6-Red Snooker, U21 Snooker and Men’s and Women’s Snooker. Men only contested the Billiards and U21's. During the two weeks I refereed in all categories which, given the schedule and workload on Referees was a tough assignment and experience. There was a total of twelve Referees listed for the event but only eleven of these presented and at times some matches were refereed by players and officials. The conditions for Referees were far from ideal and not met favourably by Referees and players which was disappointing. Referees were provided with shared accommodation (not including breakfast) and a daily food voucher valued at $20. Transport to and from the venue was provided. There was not an official meeting for Referees prior to the event commencing, just a general welcome. Overall the standard of play was competitive rather than outstanding and this was born out by the low number of high and century breaks. 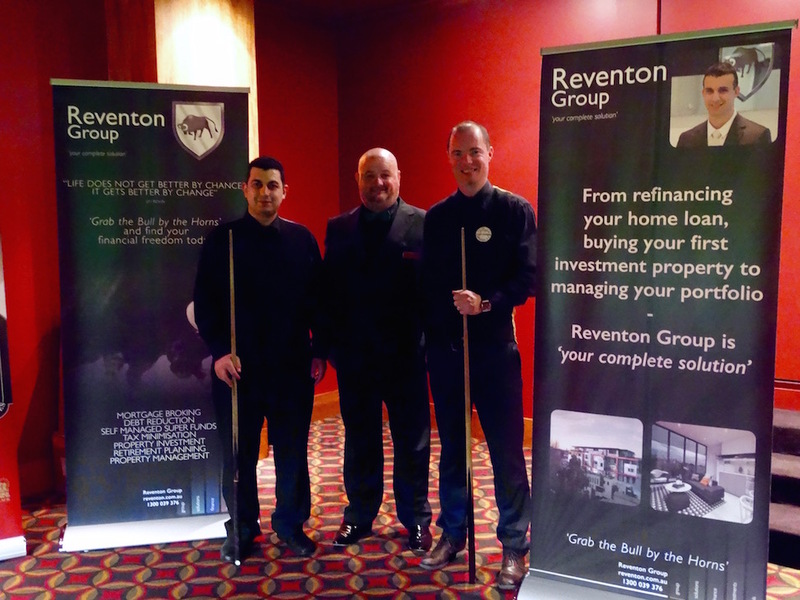 I really enjoyed refereeing the Billiards, particularly having the pleasure to officiate Mathew Bolton's break of 303. Also had a funny incident in this match when during a stroke Mathew's Yellow ball bounced off of the top pocket went about two feet in the air and landed in a pocket for a legal in off stroke! 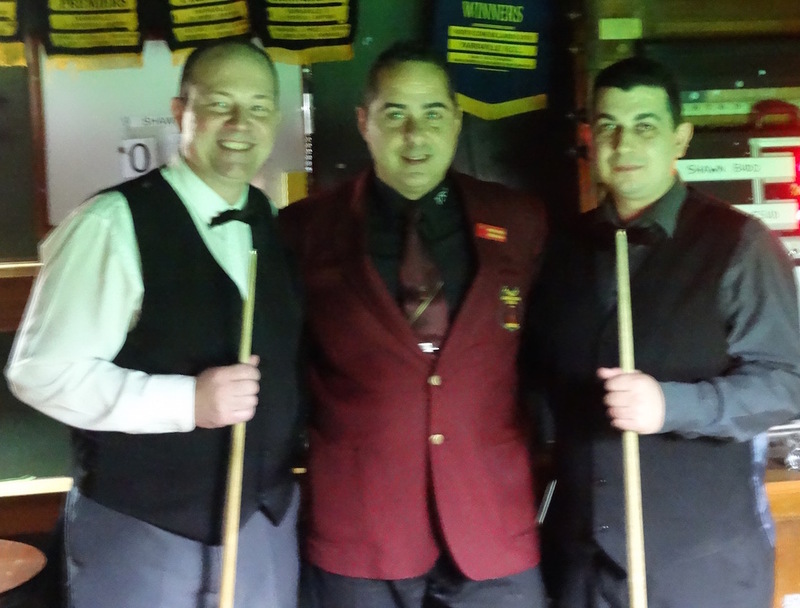 I refereed a semi-final of the Billiards between Mathew and Todd Hayward with Mathew winning 1711pts to 487pts. Mathew proved well beyond all other competitors in the Billiards section. The 6-Red competition was interesting with the frames being much quicker and often frames ending after a reasonable break was made by either player. The majority of 6-Red matches were played with roaming Referees only. Modified rules used for the 6-Red matches were communicated regularly for players to grasp the differences to regular Snooker. I refereed the final of the women’s 6-Red which was won by Susan Bussanich who defeated Anna Lynch 4-3. The U21 matches were entertaining with Ryan Thomerson proving too good by winning the final against Louis Chand of New Zealand 6-1. Matches continued during the Men’s and Women’s Snooker with mostly roaming referees and we were all getting progressively more tired. I was given a quarter final in the Women’s and a quarter final in the Men’s. Overall it was a great to meet up with all the referees and players and share the experience together. When Oceania returns to Australia next year I would certainly recommend that Referees consider participating as it is such a great learning opportunity over the various codes etc. I would like to express my appreciation to Malcolm Beehre and his team at the venue for their warm welcome and hospitality during the Tournament. Their efforts went a long way in offsetting the otherwise less than ideal conditions for all. What started out as potential disaster with a lack of funding to attract referees, short notice in which to do so, matches played on Thursday and Friday which are working days for those still in the work force and a lack of communication by some of the referees with the director of referees, turned out to be an unqualified success from the tournament director, other officials from the A.B.S.C., and the player’s points of view, due to those that did participate. From our point of view however it was less than ideal. The lack of enough participating referees placed an almost impossible burden on those that did. Matches were played without any breaks between them due to time constraints and were contested over 7 frames. This meant that we were under the hammer from the get go and were unable, in many instances to have a meal break or even a coffee break. To those referees involved goes a huge thank you, John Ivett who was an enormous help to me in my first tournament in my new role, Kim Ivett, who even had to work on Thursday but still gave up her time to be there that morning, Brendon Lang who answered the call very late after others had pulled out due to illness and his emails going to some strange place on his computer, and last but not least Martin Deeley who was obliged to work on the weekdays but gave up his Saturday to be with us. All worked tirelessly and long without complaint for fees that were less than they should have been. Frank Dewens as Tournament Director and Tania Ahmet as assistant director stepped into any breaches and special mention must go to Paul Thomerson who did an excellent job in the second semi final on Sunday and is desirous of joining our ranks. He will be a very welcome addition especially in his role as Junior Development Officer. In his final speech before presenting the prizes to Ryan Thomerson and Arthur Lin as winner and runner up, Frank Dewens was at pains to point out his satisfaction with the referees and asked me to please pass on his congratulations and thanks to all involved. So a pat on the back from the Tournament Director, the attending members of the A.B.S.C. board, and from me. 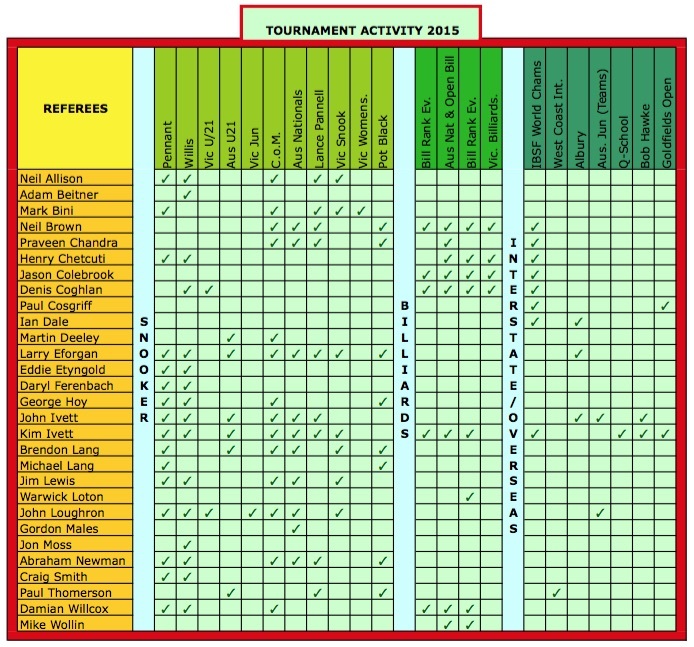 The Oceania Tournament of 2015 held in Auckland New Zealand has now been completed. 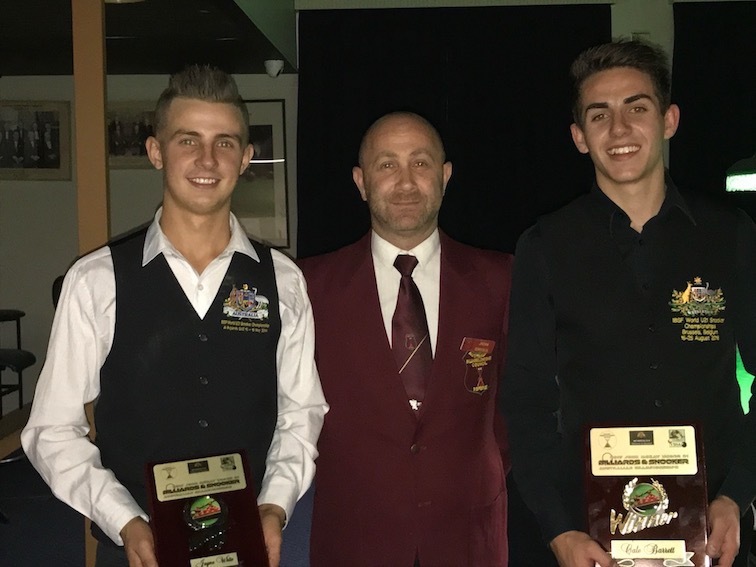 The Victorian Referees were represented by Kim Ivett who was invited in her official capacity and by Henry Chetcuti competing in the Billiards competition. We welcome them both home and trust they had a fulfilling experience in N.Z. Kim has promised a more detailed account of her experiences which will follow shortly. An impromptu seminar was held at the Fast Eddies Club by two senior referees primarily for the C and D grade pennant players. All players were welcomed regardless of which grade they played in and it turned into highly informative and entertaining evening. It is proposed that this service will now be offered, free of charge, to all the clubs playing pennant and if you would like yours to be involved contact details and a fuller explanation of the proceedings can be found on the referees info page on this website. It started when a friend of Kim Ivett asked if she could come down to their club to clarify some misconceptions and inconsistencies of fellow players when contesting the C and especially the D grade pennant competitions. As would be expected, Kim readily agreed to this and asked John if he would accompany her. No little work was done by them in preparing for the session and following is the account of the evening sent to me by John. If you would like your club to be involved in this program and if you have specific areas that you feel needs to be addressed please outline them and let us know by use of the contact details for either myself or John on the right hand side of this page. The Victorian under 21 tournament for both Snooker and Billiards was held over the weekend ending Sunday 1st March. Jon Loughron was the tournament director and he was very ably assisted by Denis Coghlan. The Snooker tournament was won by Ryan Thomerson who defeated Callum Murphy in the first semi final by a score of two frames to one, this being a best of three match. Denis was in charge of this semi whilst Jon put on his jacket (in his words) to take charge of the other. This was won two frames to nil by Adam Bleumink in competition with Emran Ali. The grand final between Adam and Ryan, which was won by Ryan 3 – 0 was refereed by Denis. Denis was also on hand to adjudicate the Billiards final on Sunday which was won by first time player Emran Ali after a quick lesson before hostilities commenced. Well done to him and a very well done to Jon Loughron and Denis Coghlan who should be commended for their enthusiasm and commitment to this event. Despite any instructions to the contrary all official rules (as well as all the V.B.S.A. playing conditions) apply to all grades. This includes Section 3 Rule 14 which covers the Foul and a Miss instructions. The rule is to be administered as stated in the rule book. The main issue to remember with this rule in D grade is that all players acting as referees must be fair to all players and to take into consideration the difference in skill of the D grade players, which by definition must be lesser than higher grades. With this in mind and only when in snookered situations, all referees are admonished to be very open in their opinions when assessing genuine attempts at an escape. When snookers are required to win a frame then a miss cannot be called. In D grade 90% of the fouls caused by snookers should not be called a miss. Referees must take into consideration whether the player from any snookered situation has struck intervening balls not on. A miss must be called unless the stroke is beyond the capabilities of the striker. Referees must take into consideration whether the player from any snookered situation has hit the stroke with enough force to reach a ball on. A miss must be called unless the stroke is beyond the capabilities of the striker. The instructions in both the sentences above must be enforced if there is a straight line path from the cue ball to any part of a ball on but can also be ignored by referees if in their opinion the stroke was difficult enough to be beyond the capabilities of the player. An example of this would be if the cue ball was tight to a cushion and the ball on was only able to be struck at its finest edge and was some distance away. Other examples may also apply. The skill level of the striker in any grade must be taken into account when making a call of Miss but is not a reason to avoid it. Larry Eforgan. Director of Referees. Please see attached "Information" for recent changes to the rules of snooker and billiards. The PDF will give you a quick overview and a complete copy of the rules may be downloaded from World Snooker's website. A new flowchart to assist with application of the Foul & A Miss rule has also been provided. This is from the Sussex referees' manual, a very handy reference for anyone wanting to learn more about the rules of Billiards and Snooker.